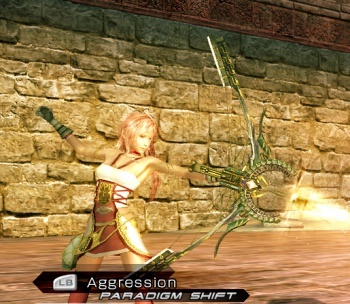 Square Enix just unveiled a solid reason to buy the Xbox 360 iteration of Final Fantasy XIII-2. I guess. See that bow in the embedded image? If you own the Xbox 360 version of Final Fantasy XIII-2 and are willing to drop $1 into the Xbox Live Marketplace coffers, you can take that baby home. Who cares? Obviously you don't have an eye for quality fletching. I mean, look at that thing! It's curvy, it's got a string, there's all kinds of superfluous pointy bits; what's not to like? I'm not doing a great job of selling this thing, huh? Let's see if the official announcement can do any better. "Azrael is named after an angel who represents spirits and death," the press release states, finally revealing a proper name for the weapon. "It is believed to possess the power to change the owner's destiny, and the player's Chain Bonus will upgrade when equipped." That's all pretty rad, right? I mean, it upgrades your Chain Bonus dude! I'm sure that will be a really, super-impressive feature when the game is actually released here in North America. Plus, the bow shares a name with Gargamel's cat! For my money that feline was the best part of The Smurfs. That old man could never catch any of those lil' blue jerks on his own. The real brains of the operation was that cat. Dude was straight up devious. Granted, he never actually got to eat any Smurfs, but that was more a side effect of starring in a largely child-oriented medium than anything else. I'm sure that in reality Azrael would have splayed their tiny blue bodies open and had a feast of azure entrails. Y'know, now that I think of it, would a Smurf have color-coordinated guts? Like, I get that "blue" is a recurring theme for these things, but it doesn't make any sense that their insides would be blue too, does it? If only because the seemingly mammalian Smurf should, by all accounts, have iron-rich blood, which as in humans, would turn red with the introduction of oxygen. Even if Smurfs didn't need to breathe, one would assume that upon cracking one open, its internal workings would assume a scarlet hue purely by virtue of postmortem blood pooling. Right? I mean, this is basic high school biology. Wait, what was I talking about originally?